One of the most popular and likely heavily debated subjects in the parking industry is sustainability. The topic has been one to elicit a significant amount of interest and excitement in public gatherings and mediums, along with a certain level of skepticism in more private settings (or at least minds). In our industry, few issues have been as progressive and transformative as sustainability. Every element of the parking experience can somehow achieve a more sustainable alternative or process, including the planning and design of parking structures; the operations, management, and maintenance of parking facilities or lots; and reservation payment and space-finding alternatives. The markets have demanded this evolution, with some operators mandating sustainability in all areas. Educational and health care institutions, corporations, transit agencies, municipalities, and developers all want to reap the anticipated benefits that more sustainable practices can provide, including reducing effects on the environment, reducing operational costs, and, of course, keeping up with the competition when touting a cutting-edge approach to sustainability in marketing efforts. On a macro planning level, the trend toward more effectively integrating parking into the overall fabric of communities, campuses, or neighborhoods—rather than isolating it as a completely separate entity—has resulted in a greater consideration of parking as a conduit to positively affect the human experience through promoting walkability, increasing mass transit and alternative transportation options, and reducing the dependence on single-occupancy vehicles. In many cases, this has helped reduce parking demand, creating opportunities for a more efficient use of often-limited land and preserving space for more community-centered uses such as public parks and green spaces, retail or restaurant establishments, residential properties, and more. On a micro level, the increased focus on sustainability has given way to dramatic improvements in building design and technology. Parking planners and designers are constantly researching and developing new sustainable building materials, construction methods, and energy efficiency improvements. Further, technology experts continue to advance new and more innovative ways to reserve and pay for parking with the latest parking equipment and mobile applications. transform the parking industry and promote innovative ideas and solutions. Sustainability has and will continue to become a critical element of the parking industry moving forward. And it is important to understand the benefits and opportunities for not only your everyday professional life but the value that it can bring to your clients and the communities around you. Several years ago, IPI had the forethought and understanding to see that sustainability would become a critical issue to the future of the parking industry. 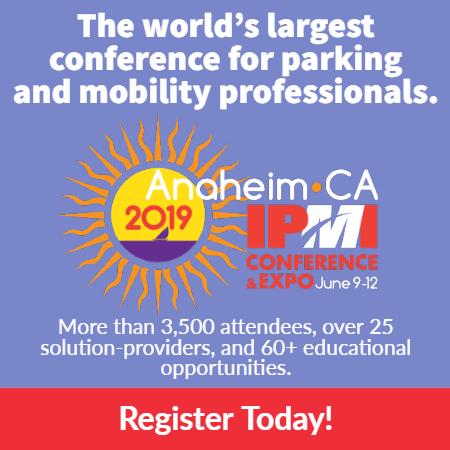 IPI wanted to exhibit to its members a strong commitment to research, education, and collaboration, and a dedication to leading the way in advancing and promoting the latest sustainability trends and technologies and the impacts to parking and transportation. As a result, IPI developed its “Framework on Sustainability for Parking Design, Management, and Operations.” The Framework (parking.org/sustainability) is a call to action, outlining the latest sustainable parking and transportation solutions and providing a guide for the implementation of these ideas. IPI’s Sustainability Framework outlined action items and goals, which, thanks to the commitment of countless volunteers and IPI staff, have been more than met. Here’s a quick recap of just a few of those goals. Development of sustainability education through seminars, webinars, and a designated IPI Conference program track. IPI offers a wide range of educational programs, including regular webinars, sustainability-specific programming at state and regional conferences and the CAPP program, onsite training programs for front-line staff, and opportunities for sustainability education at its annual conference. You can check out all of these educational opportunities at parking.org, as well as the conference programming at the 2016 IPI Conference & Expo in Nashville, Tenn. Articles and publications highlighting the latest sustainability trends and technologies. 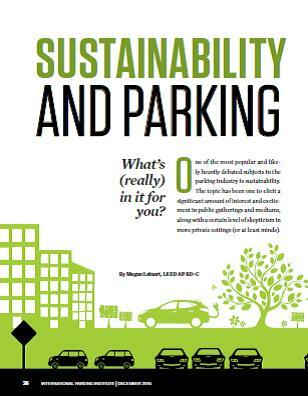 Each month, The Parking Professional features The Green Standard column. Contributed by professionals from throughout the parking industry, The Green Standard provides readers with the latest sustainability-focused commentary and ideas related to parking and transportation. 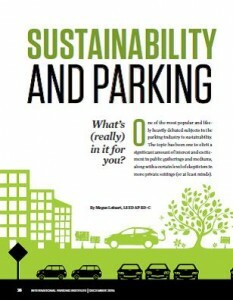 Last year IPI (partnering with the National Parking Association) released the first book solely focused on parking and sustainability. With chapter authors contributing a wide range of backgrounds, including design, technology, and management and operations, “Sustainable Parking Design & Management: A Practitioner’s Handbook” has become an important resource for those looking to learn more about the topic. Encourage sustainable parking and transportation through exhibitor visibility. IPI implemented the Green Star Exhibitor Program at its annual conference, recognizing those companies that are leading the way in sustainable management practices and operations. Exhibitors are able to promote the ways in which they promote sustainability in their everyday operations, as well as in the design and development of their products and services. Recognize the achievements and improvements in sustainable parking and transportation through awards programs. IPI encourages Awards of Excellence candidates to highlight their projects’ sustainable features. Sustainability has become an important criteria in the selection of Awards of Excellence winners, providing an added incentive to incorporating these solutions, as well as promoting them publicly. Support the Green Garage Certification program. The Green Parking Council is now an affiliate partner of IPI, with both organizations working together to promote the latest trends and technologies in parking and sustainability. At the 2015 IPI Conference, the duo recognized the first class of Certified Green Garages (see p. 26 for more)—truly a historic moment for the industry. Use effective natural resource management and reduce waste. The use of natural resources in infrastructure development is important to significantly reducing impacts to the environment, as well as operating costs. Energy provided by solar, wind, and geothermal sources do not consume fossil fuels or emit greenhouse gases but can result in opportunities to store energy onsite, or even sell unused energy back to the utility. The Casino Reinvestment Development Authority in Atlantic City, N.J., understood the importance of utilizing alternative energy options during the development of its mixed-use parking facility, the Wave. The garage features a large solar array that when combined with Solar Renewable Energy Certificates, covers the energy costs of the parking structure. The garage also features a unique educational component in the garage that provides a real-time feed of the energy being used and the contribution of the solar power. This allows garage patrons to learn more about the sustainable efforts that the CRDA is implementing throughout the facility. Focus on transportation demand management (TDM) issues. Advance and promote multi-modal transportation options, including walking, cycling, and mass transit, as well as decrease reliance on single-occupant vehicles and vehicle miles traveled. TDM strategies can dramatically change the pleasant feel and efficiency of a community by providing options for reducing vehicle miles traveled and the dependence on single-occupancy vehicles. They also work by increasing travel options through supporting biking and walking routes, adding or improving public transit systems, and implementing policies and incentives to encourage alternative transportation. Effective parking management practices are also important TDM best practices, encouraging shared parking, utilizing effective land-use management, unbundling and taxing parking, and promoting mixed-use integration and density. Stanford University has implemented a comprehensive TDM program, complete with free and discounted transit, vanpool subsidies, significant bike safety and infrastructure improvements, a campus-wide shuttle system that connects to regional transit and the community, data-driven program development, and a creative marketing and outreach program to encourage more sustainable commute behaviors. Stanford’s TDM program also incorporates a number of parking initiatives, including the addition of EV charging stations for vehicles and its growing number of 100 percent electric buses, preferred parking for carpools and vanpools, and the continued reduction of surface and street parking, while transitioning most new parking to below grade. Encourage alternative energy sources and energy savings technology, reduce reliance on fossil fuels, and accommodate alternative fuel vehicles. IPI, along with a number of like-minded associations, has led and supported the Lighting Energy Efficiency in Parking (LEEP) Campaign, which offers free guidance and recognition to facility owners interested in implementing energy-efficient lighting in their parking lots and facilities. To date, participants have collectively saved over 120 million kilowatt-hours and over $10 million annually (based on 430 million square feet of high-efficiency parking lighting). See p. 40 for more on this year’s LEEP competition. The University of Minnesota upgraded the lighting in all 18 of its parking facilities at its Minneapolis campus to energy-efficient LED lighting and implemented lighting controls. As a result, the university achieved 90 percent energy savings and a 29 percent return on investment in just the first year. As you can see, in just a few short years the tide has changed significantly in our industry, and there are now many opportunities and resources for the sharing of ideas, promotion of education, and implementation of new and innovative sustainable applications and technologies regardless of your involvement in the parking and transportation community. IPI is committed to continuing to push these goals forward and developing even more programs and resources for its members. It is clear that sustainability will continue to be an extremely important topic not only in the parking industry, but in our communities, neighborhoods, and campuses as well. Governments, municipalities, and private entities will continue to enforce stricter demands related to sustainable community planning efforts, energy-efficiency strategies, and environmental building materials, all of which will significantly impact the parking landscape. Owners and operators will seek improvements to the efficiency and economic viability of their parking facilities, while reducing the impacts to the environment as much as possible. Consultants and innovators will need to keep up with these demands by researching and developing more creative and cutting edge design strategies and technologies. Now and into the future IPI and the GPC will be a force for proactively encouraging these practices. Together, they will continue to work with communities and government agencies to ensure that parking is effectively and appropriately considered so that it is seen as a positive influencer for sustainable planning and building practices, rather than a hindrance. Further, they will continue to provide the education, resources, and support needed to enable their members to keep up with these changing demands. Now is an extremely exciting time in our industry. Until recently, “parking and sustainability” was considered an oxymoron, yet we are now experiencing some of the most innovative ideas we’ve ever seen. The value that these advancements will continue to provide in terms of knowledge, business opportunities, and environmental impacts are immense and will continue to drive advancement of the industry for many years to come. Megan Leinart, LEED AP BD+C, is national director of corporate development for Propark America. She can be reached at megan.leinart@propark.com.